One of the more surreal moments of the seven years I worked on my biography of Sargent Shriver occurred fairly late in the process, when I was invited to his house in Potomac, Maryland, for dinner. By this point, in the summer of 2003, Mr. Shriver had begun his descent into Alzheimer's, which was affecting his short-term memory and sometimes gave him trouble precisely identifying people at first. But his long-term memory was still good, and his analytical faculties remained for the most part intact, and he was always excellent company. I was looking forward to meeting him that night and hearing his thoughts (which generally remained astute) on some chapters I had recently sent him. He greeted me in the living room with his usual warmth and enthusiasm, eyes alight with pleasure. "Well, it's good to see you, you look terrific," he said, giving me a hearty handshake. I asked him how he was doing. "Fantastic," he said, escorting me to the liquor cabinet at the far end of the room. "Let me tell you about something great." And as he poured our drinks, he told me about what was on his mind. "Listen," he said. "This is the most amazing thing. There's this guy who is writing a book about me, and I've been reading chapters of it. It's spooky" - that was a favorite Shriver word - "how much information he's got about me. It's uncanny!" My heart sank; this was catastrophic news. As I had labored month after month on the book, and one year had become two and then three and then seven, one of my fears was that someone would beat me to the punch. I mean, after all, here was one of the great, underappreciated figures of modern American history - founder of the Peace Corps, commanding general of the War on Poverty, vice presidential candidate, and so much more - and no one had yet written a full-length biography of him. Only now, I was learning, someone else was. And here was Shriver - using one of the signature motivational technique he'd perfected while running the Peace Corps - goading me into working harder by letting me know that a competitor was now also tilling the same terrain. If I didn't want to get beaten, I'd better work faster, and better. Yes, he said, and he went on to regale me with some of the "amazing" tidbits this writer had unearthed, and all the hundreds of people he had interviewed, and my mood got bleaker and bleaker - this other guy seemed to have almost everything I did. How had I not gotten wind of this earlier? Great, I thought bitterly. Seven years of my life wasted. And then as Shriver went on, enthusiastically detailing what this other writer was doing, the light dawned: That other writer was me. Or, rather, Shriver didn't realize that I was me. Momentarily befogged by his Alzheimer's, he was telling me about my own book. I let him go on for a few more minutes, just to make sure I was right. (Also, what an unusual opportunity: to get an uncensored opinion of your work from someone who doesn't know that the work is yours - and from someone whom, furthermore, the work happens to be about.) Then, as gently as I could, I steered him toward awareness. "Mr. Shriver," I said. "You're talking about my book, right? In that section on the founding of Head Start, do you think that I've managed to reconcile the conflicting views about where the idea originated?" And then something slipped into place in his mind and Shriver, with the grace and social skill that is characteristic of some Alzheimer's patients and that was even more characteristic of him, smoothly moved the conversation forward, and for the rest of the night - over drinks and dinner and coffee - he discussed the relevant chapters with lucidity and great exuberance. Moments of exuberance like that, even from within the clutches of Alzheimer's, are what stand out most memorably from seven years of toil on the book. Even as the disease robbed him of his memory, and sometimes of his logic, it did not rob him of his spirit. The essence of that spirit - warm, ebullient, devout, inspiring - remained. That spirit was unique, and essential to all that he achieved. One day in the summer of 1997, during the first week I spent intensively interviewing him at his summer home in Hyannis Port, we got to talking about his German ancestry, and about the summers he'd spent in Europe as a schoolboy in the 1930s. And that got him talking about his love of certain aspects of Germanic culture, which in turn got him talking about how years ago he and his son-in-law-to-be, Arnold Schwarzenegger, had bonded over their shared roots in that region of the world. We were sitting on the veranda overlooking the Atlantic Ocean (in my tapes of those interviews, his voice is sometimes inaudible over the sound of the wind blowing and the water lapping), and he suddenly stood up and said he had to go get something. Next thing I know, he's reappeared wearing the authentic leather lederhosen Schwarzenegger had brought him years ago from Austria. Shriver had, as he ruefully noted, put on weight since he received the gift, so he sort of had to jam himself into them, and was spilling out a little over the top, and his 82-year-old legs were poking out the bottom of the shorts, and he had to leave the leather shoulder straps unfastened, and he generally looked ridiculous. Yet when we continued the interview, him still in his lederhosen, talking about how his eighteenth-century forebears had fled the wars of Europe to set themselves up as tanners in one of the first German-American settlements among the Native Americans tribes of the embryonic United States, he was completely unselfconscious and, as always, somehow charismatic. Shriver's enthusiasm and his joie de vivre were incomparable. His idealism was lofty; his intellect (despite persistent murmurings by jealous competitors, less smooth and charismatic than he, that he was a "lightweight") was penetrating and didn't always suffer fools gladly; his commitment to service - to serving his country, to serving God, to serving those less fortunate than he - was utterly serious. Yet what kept him from becoming ponderous or intimidating (as his formidable and amazingly accomplished wife, Eunice, could sometimes be) was his remarkable lightness of spirit. I am not going spend much time here recounting his many achievements and his historical importance - I spent seven years and more than 700 pages doing that in my book. But I do want to emphasize a few things. As I wrote in the biography, Shriver's achievements - his pivotal role in getting John F. Kennedy elected President in 1960; leading JFK's "talent hunt"; his founding (against long odds) and leading the Peace Corps; his launching of Head Start, Legal Services for the Poor, VISTA, and many other programs as part of the War on Poverty; his presiding over the Paris Peace Talks on Vietnam; his helping his wife to found the Special Olympics; his cultivating a generation of public servants who will continue to exert a powerful influence on American history for years to come - make him one of the major figures of the second half of the twentieth century. It is, as my wife (herself a former Head Start teacher) said recently, "criminal" that Shriver is not better known. (She also says that no one she has ever met better exemplified the best parts of the Christian faith.) And as I myself have frequently said - echoing his former War on Poverty colleague, Colman McCarthy - a good case can be made that Shriver, through the programs he started and ran, and through the generation of public servants he inspired, may have positively affected more people around the world than any twentieth century American who was not a President or other major elected official or Martin Luther King. One of the things that I hope comes across in my book is that inscribed in Shriver's character is the compulsion to make the world a better place. At the end of every day, ever since he was in high school, he would ask himself, in effect, what I have done to improve the lot of humanity? Even into his eighties and nineties, when he should have been playing golf and resting on his laurels, he was still trying to do more - traveling the world on behalf of Special Olympics, raising money for public service programs, helping his children strategize about their various charities and political activities. When his Alzheimer's disease deepened, what seemed to remain was a fixation on two things: his wife Eunice, and how much he loved her; and that we should all be working to make life better and more peaceful and more just for our fellow humans. For me, a member of Generation X, exposure to Shriver was a revelation. I grew up in the shadow of Vietnam, Watergate, the hostage crisis, stagflation, oil crises, impeachment, and later 9/11 and the War on Terror. Public service, for my generation, often seems to be a hopeless, or a hollow thing. It can be hard even to say the words "make the world a better place" without having them stick in your throat, so hopelessly naive and lacking in irony do they sound. For Shriver's generation, their experience of government and of public service was much different. They saw the New Deal help lift millions from Depression; they saw the Allies defeat Totalitarianism; they saw the post-War boom, the Civil Rights movement, and America put a man on the moon, just like JFK said we would. So much that he'd seen and done had instilled in him the faith that public service could be a powerful and positive force; so little that I've seen has conveyed that. Shriver's voice, then, is a voice from a more hopeful past. But while he was in part a product of his times, his optimism and idealism and commitment to service transcend the particularities of his time and circumstance. His career is a rebuke to cynical journalist types like me who focus on what's wrong with things, what's "realistic," what can't be done; Shriver always focused on what can be done - and often the things that he accomplished (starting the Peace Corps in just a few months, or getting 500,000 kids into Head Start programs its first summer when the "experts" said that 10,000 kids was the maximum feasible) were things that everyone beforehand had said were not realistic, or were downright impossible. Shriver had a gift for what one of his old War on Poverty colleagues called "expanding the Horizons of the Possible." In my darkest moments of despair over my biography of him, when I had a half-written, 1,000-page pile of garbage, and I'd think to myself that I'd never be finished, and that this wasn't worth pursuing, I'd tell myself, "For God's sake, Shriver ran the Peace Corps and the War on Poverty - at the same time, while raising five kids! - so you can damn well finish this book." I tend to think of myself as a pretty cynical guy. I am not easy to inspire. But Shriver awakened in me - just as he did in thousands of others - the notion that it is always worthwhile to work harder, to do more, to dream bigger about working for peace and social justice. A final note about his faith. The root of Shriver's self-conception was as a lay Catholic, as a non-clerical servant of God, who tried always to model his life after the ethics of Jesus as expressed in the Gospels. This was not a passive pursuit. Always he was asking himself, "Am I living my life as Christ would want me to?" As I noted in the book, there are many breeds of religiosity among the devout, cutting across faiths and denominations: the fire-and-brimstone sermonizer; the zealot; the Puritan; the holier-than-thou; the power-hungry; the ritualistic; the superstitious; the lonely; the desperate; the God-is-a-tool-for-realizing-my-desires instrumentalist; and the skeptic, to name just a few partial variations. Shriver is none of these. Nor, strictly speaking, did he sign on as a man of faith for a ticket to the afterlife, or to Heaven (though he aspired to get there). Rather, what Shriver derived from his faith was less the solace of Lord's presence, less the promise of transcendence in the hereafter (though he did derive both of those qualities from his faith) than a kind of mobilizing vision for action here on earth. It is telling that in the 1930s Shriver invited Dorothy Day to speak at his undergraduate institution, Yale. Shriver's Catholicism was in some ways analogous to Day's: rooted in the ethics of the Christian Gospels; dedicated to working toward peace, social justice, and redemption of suffering here on earth; and concerned especially with the easing the plight of the poor and the disabled. In some ways, Shriver and I were a different as can be - him an optimist about human nature, me a pessimist; him devoutly faithful, me a struggling agnostic. But I am nonetheless unequivocally sure of two things. 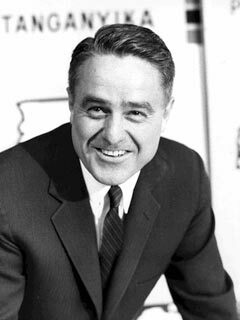 One, if there is a heaven, Sargent Shriver is on his way there now I tend to think of myself as a pretty cynical guy. I am not easy to inspire. But Shriver awakened in me - just as he did in thousands of others - the notion that it is always worthwhile to work harder, to do more, to dream bigger about working for peace and social justice - or no one is. Second, even if there isn't heaven, his legacy of good works here on earth is an inspiration and a goad for all of us to do more and better. Scott Stossel is deputy editor of The Atlantic and the author of the award-winning "Sarge: The Life and Times of Sargent Shriver"